137 Pillars House, a local 5 Star luxury hotel has shown a real commitment to corporate responsibility by recently setting up an onsite environmental program to do their part to reduce the haze and smoke that plague Chiang Mai every year. The tourist industry in Chiang Mai is largely affected by the smoky season, with a loss of revenue estimated to be 2 billion Baht a month. The 137 Pillars House program will benefit the local community and guests that visit during the smoky season. General Manager Anne Arrowsmith contacted Warm Heart Environment and asked if Dr. Michael Shafer would help set up an environmental program. Warm Heart was delighted to participate. 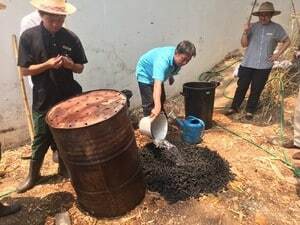 The Biochar training session was held on April 8. Michael explained to the staff how biochar can help increase the fertility and pH balance of their gardens, enabling increased productivity as well as providing protection against some foliar and soil borne diseases. Warm Heart then demonstrated how to make biochar using the smoke free biochar burners. The gardening staff currently collect several large lawn bags a day of garden trimmings and dead leaves, which are perfect for making biochar. The kitchen staff will be working with the gardening staff providing organic compost to mix with the grass cuttings. Biochar has many uses other than as organic fertilizer that replenishes the soil. Biochar is an excellent odor and moisture absorbent and natural deodorizer. Plans to use the biochar include placing pans of the charcoal underneath beds to help keep rooms smelling fresh and keep the moisture and mildew down. It will also be used in linen closets, and in the kitchen to absorb smoke and odor. Warm Heart is excited about the opportunity to introduce Biochar into the hotel industry and hopes more hospitalities will embrace the benefits of biochar. General Manager Anne Arrowsmith is inviting other local hotels to join in the effort to help reduce the smoke that chokes Chiang Mai during the smoky season. Warm Heart appreciates and applauds the efforts of 137 Pillars House participation in helping to reduce the hazardous smoke and haze that affects all of us.